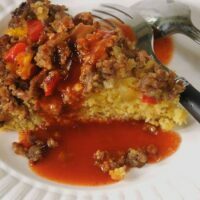 Try this cornbread baked over a layer of hot sausage and peppers. When it comes out of the oven, carefully flip the whole mixture onto a platter. 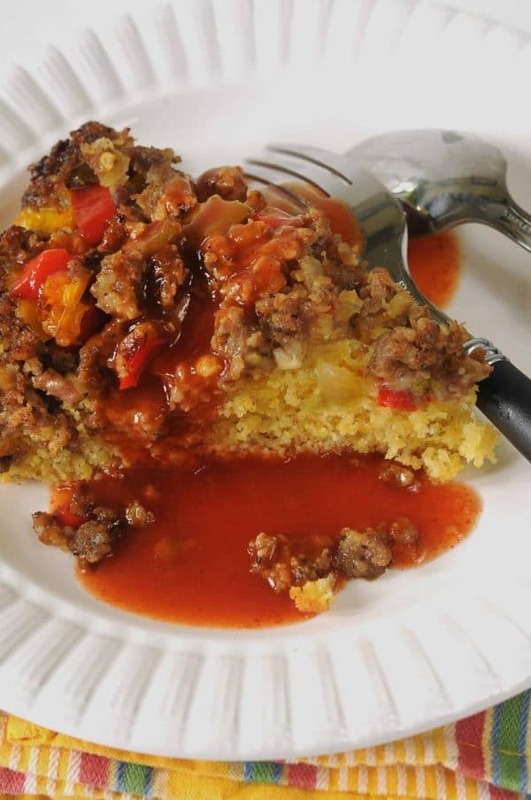 Serve Upside-Down Sausage and Pepper Cornbread with warmed enchilada sauce. Wouldn’t hurt to add a little cheese on top and guacamole on the side. Back in the day, I used to spend hours trying to learn how to do a back flip. In my yard. With no spotters. Crazy! I know. In the end, I mastered a handspring but never managed a flip. After baking Upside-Down Sausage and Peppers, you will carefully FLIP it out of the pan and serve it upside down for a memorable meal. We like to eat it with warmed enchilada sauce poured over the top. Three different colors of peppers are added to “hot” pork sausage for added color. Although you could use a mix or your own cornbread recipe, our favorite cornbread comes from the back of Lamb’s Stone Ground Corn Meal package. 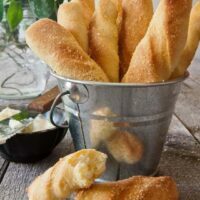 It’s perfect for this recipe due to the sturdy texture. 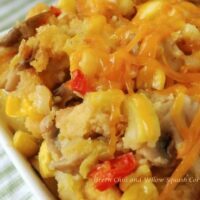 Pour cornbread batter on top of meat, veggies, and cheese. 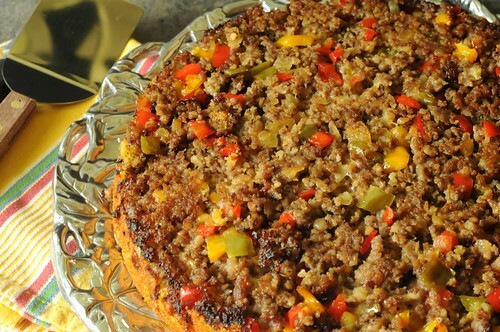 Try serving Upside-Down Sausage and Pepper Cornbread with a pot of pinto beans. You will find it tastes fabulous crumbled into the beans and juice. OR, pour canned or homemade enchilada sauce over the top. A cheese sauce or queso would also be tasty. Then again, you might prefer it plain However, we are the condiment family so we like it best with a sauce. Lightly brown sausage in 10-inch skillet. It will get browner in the oven so don't go too brown now. Add onion and peppers to skillet and cook until tender. 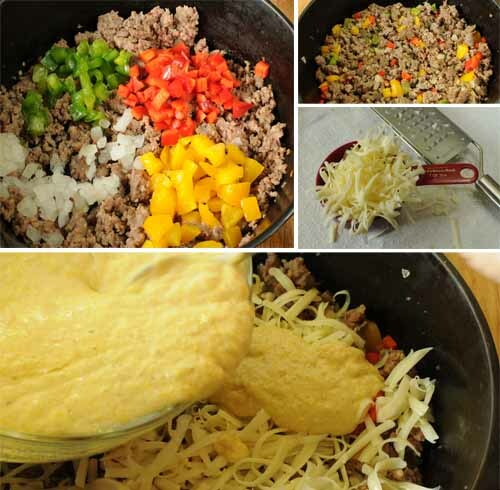 Sprinkle shredded cheese over meat mixture. Pour cornbread batter on top. Bake in preheated oven for 25 minutes or until golden brown. Place serving plate over the top of skillet. Carefully flip cornbread over resulting in the meat layer on top. Pour hot oil into batter and stir briefly. Go to step 4 above. Spicy mixture of yellow squash, corn, green chilies and cornbread. Southern cuisine mixes with Tex-Mex flavors. 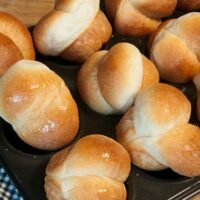 Cornmeal Dinner Rolls | A Bread Machine Recipe makes a yeast roll formulated to be mixed and kneaded in a bread machine with just enough cornmeal to add a slight but interesting crunch to the crust. Sheila, I don’t see a link to your blog. Be sure to let me know when you start it as I would love to come visit. I made this tonight and it was absolutely delicious! I used Jiffy cornbread mix instead of the homemade one but it still turned out delicious. The flavor is great but I highly recommend pouring syrup over it before eating which makes it that much more addicting. Syrup?? Wow, my husband would go crazy for that combination. Glad it turned out good for you. I came here looking for cookies, and found this yummy looking dish. Now I know what I’m making for dinner later this week. Yum what a great looking meal. I love cornbread! This looks awesome!!! I will be making this soon. I would like to know how you cook your pinto beans, in the crockpot all day or simmering on the stove? I am looking for an easy way….. This is an irresistable dish. 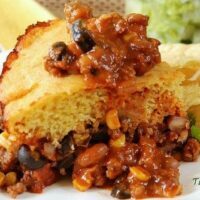 I love cornbread and corn muffins and either meat or cheese enhances it beautifully. Making a note to make this weekend. What a great dish! I love pork – and now have a reason to buy some. I also love cornbread, but rarely make it – except for that one dismal moment last month when I made muffins from the Jiffy boxed cornbread mix. Let’s just try to forget that happened…. 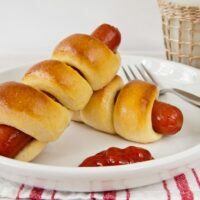 This is a great, unique dish!!! Wow…that looks really good. Such a neat idea. My guys love spicy sausage and I can never think of much to do with it, so here’s an idea I can steal…thank you! Looks very nice.